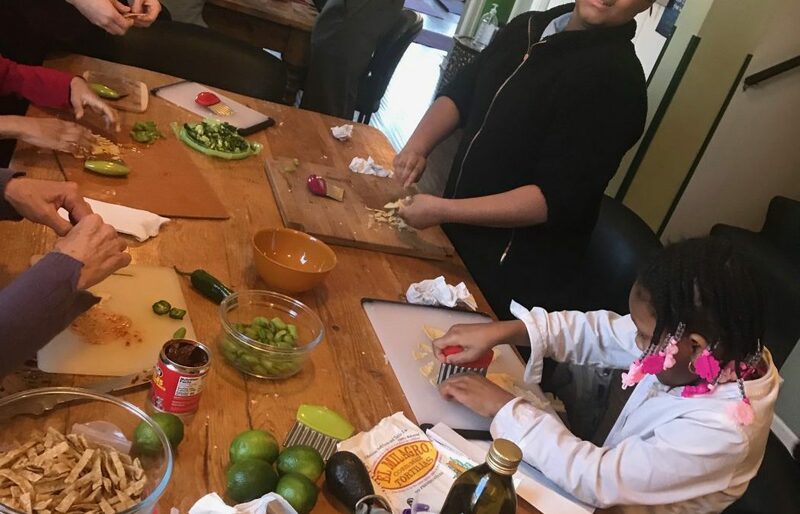 This week we made Black Bean Tortilla Soup for Life After School, the after school program. The kids did a great job and enjoyed the soup with all the fun toppings. Everyone tried it, even if they didn’t like it. I appreciate them trying the food. The kids cut up the onions, garlic, jalepeño, cilantro and limes. We sauteed the onions and garlic in olive oil in the Instant Pot, added the spices, chipotle peppers and beans, tomatoes, broth and salt. Let that cook as we prepared the toppings, I made tortilla strips ahead of time. I cut tortillas into strips, tossed with olive oil, salt and chile powder then baked in the oven at 325 for 20 minutes. For toppings we had jalepeños, cilantro, limes, sour cream, panela cheese and tortilla strips. The kids had fun choosing what to put on their soup. One of the kids said, “on a scale of 1-10, from ‘this is disgusting’ to ‘I want some more’ this is “What’s the recipe? !’” I love it when the kids are excited about the food, trying new foods or eating foods in a different way. I find that as they get more involved in the cooking and the process they get more excited about trying the food. And its a bonus when the adults and staff like the food as well! I like to make food that is seasonal, local, fresh from the garden or somehow relevant. With this cold weather we’ve been having, and this never-ending winter, I decided to go with Black Bean Soup. Heat the oil in a large dutch oven or Instant Pot, saute the onion, add the garlic, chipotle pepper, cumin and a pinch of salt. Then add the beans, tomatoes and vegetable stock. The liquid should just barely cover all the ingredients. Add more stock or water if needed. Add the tortillas, they will dissolve into the soup and thicken it up. This took 7 minutes in the Instant pot, 20 min on stove top dutch oven. Serve with crispy tortilla strips, onion, cilantro, jalepeño, avocado, sour cream and cheese. Enjoy!